Recently the kids decided that, though they had loved their over-sized swing set, they had outgrown it, both physically and developmentally. During our discussions about what do with the freed up space in the garden, the kids always requested a fire pit. Like always, we drew some sketches, did some internet research and talked to friends who had fire pits. We knew we neither needed anything over scaled or too costly. 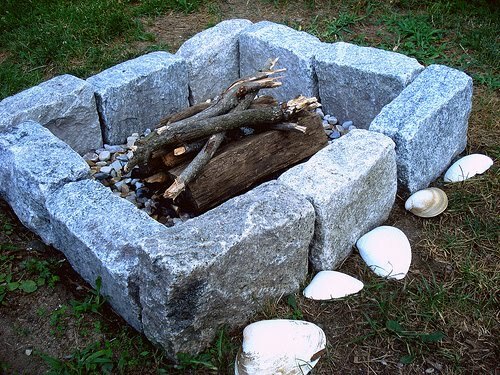 We also wanted the fire pit to serve several functions, like cooking, entertaining and as well as be aesthetically pleasing and from materials that are long-lasting. In other words, sustainable. We also considered our propensity for changing things in the garden and we were sure we did not want something ugly overbuilt and permanent. For this reason, we began our fire pit search by looking at the freestanding styles, often made of cast iron, aluminum or steel and most ran at least $80 and often more. 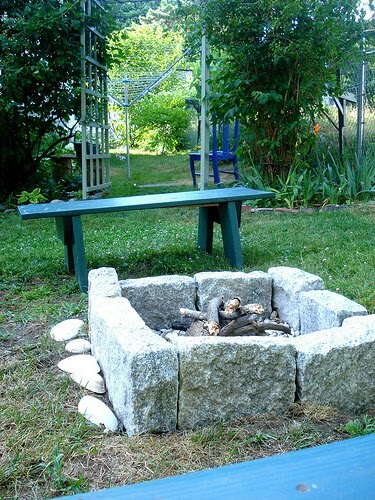 The portability of the freestanding fire pits is convenient, but we weren't convinced we'd have a lot of places to more our fire pit to in our small garden. 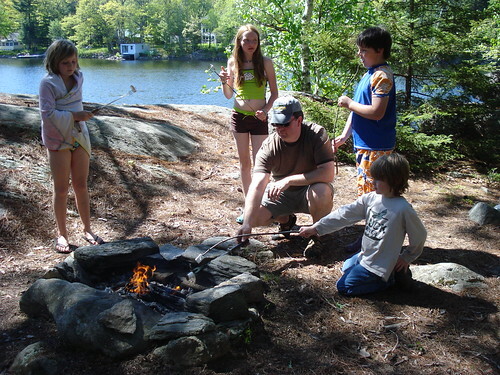 Also, after reading a few reviews on-line and talking to some friends, we learned that many of these same fire pits don't last much longer than a year, and our salt air and minimal off season storage for such things meant an even shorter life for a metal fire pit. In other words, unsustainable. So it was more sketches, more thinking and then doing nothing, for a little while, which is beneficial because sometimes it's good to not over think things too much. Not that anyone in our house is guilty of doing this. Eh hem. 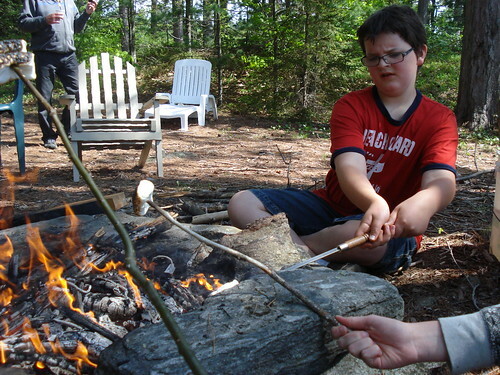 However, what I was thinking about was the fire pit at the Bradstreet homestead, at The Point. Of course the fire pit at The Point is made from rocks gathered from the land, something we didn't have the option of doing here, but it was an inspiration regardless. It's simple, made of natural materials, locally sourced, lasts forever and fits naturally with the landscape. That's what we wanted. We thought we might get some stones, locally, but having worked with these laying our garden path, we knew that technically, they are moveable, but in reality, it would be a permanent fire pit. However, we did find some granite cobblestones. Alex immediately began laying some out and we loved how it looked, plus it met all our requirements, and it was well within our budget. Along with the granite we purchased some sand and river rocks. Once home, Alex dug out a patch of sod in our chosen location, slightly larger than the fire pit would be. The sand was poured over the patch of soil and spread evenly. Then Alex fitted the cobble stones into a rectangle, approximately 3 feet across. 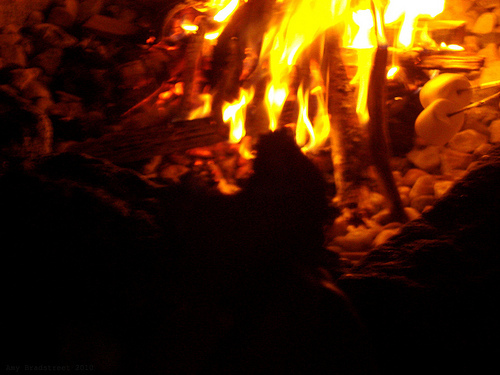 Once the stones were placed, the river stones we spread in the bottom of the fire pit. The entire construction process took less than two hours and cost us about $80. We are very happy with our design. 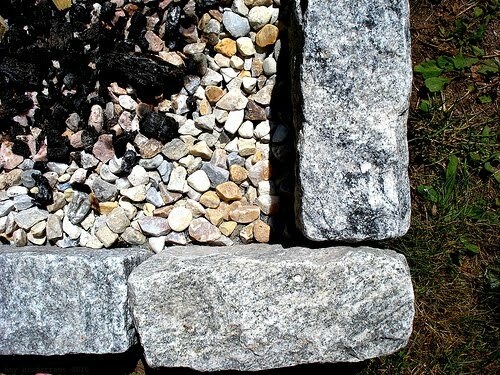 It's simple, beautiful, useful (we can use a grate across the stones for cooking, or construct a tripod above it, for instance), it will last forever, yet we can easily dismantle it, move it, or reuse all the materials, if we choose and we haven't done anything to alter our garden drastically. Yes, it's sustainable. With the abundant free firewood Alex found at the transfer station, ayuh, we've already enjoyed gathering around the fire pit to roast those marshmallows. We even sang some songs. See, sustainable and fun.